Jerusalem (in Hebrew יְרוּשָׁלַיִם and in Arabic أورشليم القدس) is the capital of Israel as well as an important city for Judaism and Christianity, along with Islam. Although most of the international community refuses to recognize that it is Israel's capital city, some countries do recognize its status, most importantly the United States since U.S. President Donald Trump made that announcement on December 6, 2017. The Old City (0.9 square kilometers) was, until the 1860s, the entire city of Jerusalem. It is at present part of East Jerusalem. Archeologists have confirmed that Jerusalem was the capital of the United Kingdom of Israel more than 3,000 years ago after King David had conquered the city. His son King Solomon built the First Temple in 960 BCE. In 586 BCE the Babylonians destroyed Jerusalem and demolished this temple. Finally in 539 BCE emperor Cyrus the Great conquered Babylon and in the following year he made a decree sanctioning the return of the Jews, and ordering the rebuilding of the Temple at Jerusalem (2 Chronicles 36:23; Ezra 1:1-4). This decree also included the return of the Temple’s sacred vessels and furnishings as well as the levying of a tax upon his western provinces to provide building materials, in addition to what was offered willingly (Ezra 1:6-11, 6:3). The relatively small number of exiles who chose to return for this work (40,000) were led by Sheshbazzar, “the prince of Judah” (Ezra 1:11), whom some identify with Zerubbabel, likewise named “governor of Judah” (Haggai 1:1). The Second Temple was finished in 516 BCE. Later Jerusalem was at times ruled by the Greeks, the Hasmonean and finally by the Romans which also crucified Jesus Christ here. In 70CE they destroyed the Second Temple and many Jews left Israel. In 638 CE caliph Umar conquered the city and some decades later the Dome of the Rock was built on the sites of the Jewish Temples. During the First Crusade in 1099 CE Jerusalem was captured by the Crusaders, but Muslim sultan Saladin could regain the city in 1187 CE. During the 1948 Arab-Israeli War the Old City of Jerusalem was conquered by the Arab League and all Jewish residents of the Jewish Quarter were expelled or killed. Jerusalem was unified under Israeli control after the Six-Day War of 1967; it had, between Israeli independence in 1948 and 1967, been divided between Israeli West Jerusalem (some 55 km2) and East Jerusalem (some 70 km2). The Knesset (the Israeli Parliament Building) is located in West Jerusalem as well as the Museum of the Holocaust. On December 6, 2017 President Trump ordered to move the embassy of the United States from Tel Aviv to Jerusalem. Previous presidents Bill Clinton, George W. Bush and Barack Obama also promised to recognize Jerusalem as capital of Israel during election campaigns but refused to keep their promise during their tenure. Consequently, Paraguay and Guatemala also moved their embassies to Jerusalem. 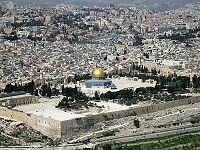 Jerusalem is considered holy by Jews as their ancient capital and home of their most holy site, the Temple Mount, as well as by Christians for its association with Christ and the Crucifixion, and by Muslims as the location of the Dome of the Rock. However while the city is mentioned in the Old Testament more than 500 times, it is not mentioned in the Koran anywhere. The Muslim Quarter which is the biggest one; the Dome of the Rock (home of the Al Aqsa Mosque) and Temple Mount are located here. The Jewish Quarter with the Wailing Wall (also known as the Western Wall). The Christian Quarter, where churches, monasteries and shines line the Via Dolorosa. The Armenian Quarter which is the smaller one. Although not equal in size, the four quarters form a rectangular framework. The street running from the Damascus Gate to the Zion Gate divides the city into east and west. The street leading from the Jaffa Gate to the Lion’s gate divides it from north to south. ↑ Trump tweet touts Jerusalem move, taunts past presidents. Fox News. December 8, 2017. Retrieved December 16, 2017. This page has been accessed 27,525 times.